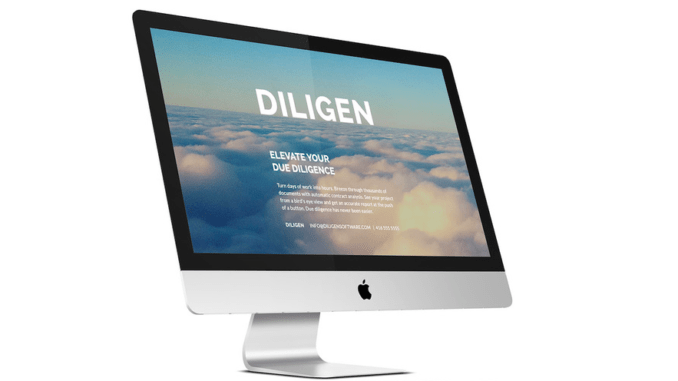 Toronto-based AI startup Diligen has entered the battle for a share of the legal due diligence market. In what is now a rapidly growing legal tech market, Canadian company Diligen is joining a number of startups targeting law firms with an AI-driven due diligence capability. The eight-person company already has several law firm clients, though at present isn’t at liberty to name them. The company only started last year and says it has not, as yet, ‘officially launched’, though it is in full operation. Founders, Laura van Wyngaarden and corporate lawyer Konrad Pola, said that their company’s project management focus is what differentiates them from other AI-driven due diligence providers. That is to say, she added by way of analogy, ‘all cars have engines but different companies produce a variety of cars with different features’. Diligen’s planned USP is the strength of their project management and collaborative features. The company’s software is designed to help with assignment of any documents that need to be examined by a lawyer and tracks the progress of a due diligence team’s work on a project using an easy to use interface. Van Wyngaarden and Pola added that the origin of their company goes back to a phone call between the two when Pola was working at his desk at 4AM on a due diligence project in Toronto. The realisation hit them that there had to be a better way of doing this essential, yet gruelling and time-consuming, work. ‘We wanted to solve this problem,’ said van Wyngaarden. The solution had to be AI as ‘machines are very good at looking at large sets of data’. She added that there appeared to be more openness in the legal market to adopt this technology. There was also a growing awareness that AI-driven due diligence is more accurate than a group of tired junior lawyers. The other key issue driving the uptake of AI-driven due diligence was its lower cost. Pricing pressure and competitive bids for such work was placing law firms in a position where they needed a solution. Fixed fees also meant that the traditional model of using time as a means of billing clients was no longer as relevant. The use of AI systems will also allow smaller firms that do not have a large associate capacity to ‘dial up and down’ their ability to handle due diligence matters for clients, where before this would have been a challenge. Van Wyngaarden added that as the competition for market share in the AI due diligence market increased one of the deciding factors ‘will come down to user experience’ and whether AI companies could put themselves in the minds of the users of such systems. Diligen is hoping to do just that. AL Interview: Can Luminance Light Up the Due Diligence Market?